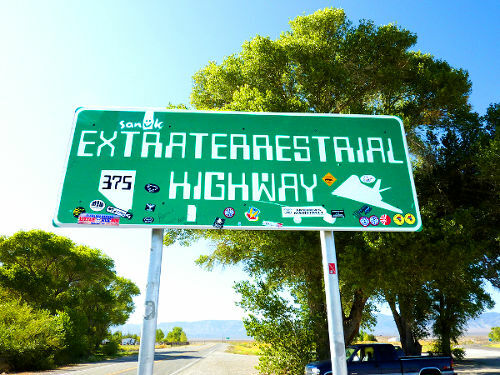 In 1996, amongst much fanfare, a 98 mile (157.7 km ) stretch of Nevada's State Route 375 was christened Extraterrestrial Highway. A ceremony was held in the well 'visited' town of Rachel Nevada, located about 150 miles north of Las Vegas. 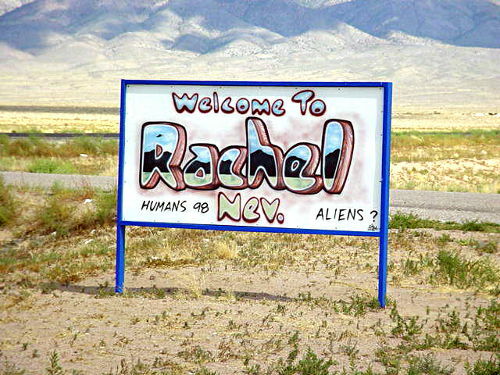 Rachel, population about 100, is situated along the central part of the Extraterrestrial Highway. Being the only settlement along this stretch of road, Rachel has been the meeting point for tourists. Seeking to encourage this new flood of interest in the area, the Nevada Commission on Tourism appealed to the state government to change the highway’s name. 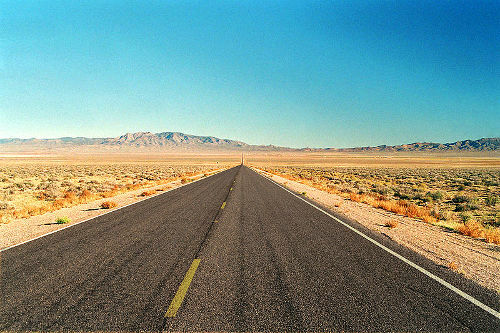 Drawing on the popular UFO and alien interest surrounding the area, the Extraterrestrial Highway was born. At the time of the renaming of Highway 375, Twentieth Century Fox was getting ready to release its epic picture “Independence Day” starring Will Smith, Jeff Goldblum and Bill Pullman, about aliens invading Earth. Seeking to capitalize on a publicity opportunity, the movie studio sent some of the film's stars studio executives to the highway's renaming ceremony. There have been claims that this area of central Nevada has more alien and UFO sightings per year than anywhere else in the world. And there are plenty of strange happenings here – odd shaped flying objects and mysterious lights in the sky. Non-believers attribute the unusual flying objects, lights and happenings to activity from the secret US Government base, Area 51. 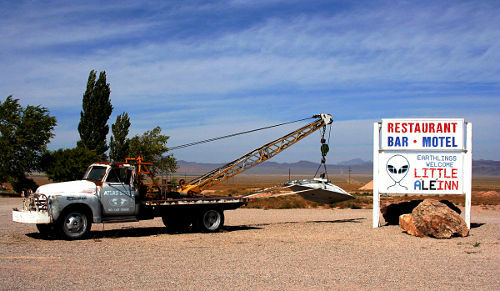 Among other things, Area 51 is a development and testing facility for new military aircraft technology. Believers have other more galactic explanations of the mysterious occurrences in the area. Although the Extraterrestrial Highway gained international exposure with a big push for increased tourism by the state, it is still one of the Nevada’s least traveled highways with only about 200 human visitors traveling on a day.